Pâtes de fruits is a traditional French candy commonly known as fruit jelly in English. 100% vegetarian with Pectin as a gelatin agent which used in this product (Pectin is fruit based compose of sugar pulps and apple pectin. The fruit percentage ratio is more than 90% of the total component). 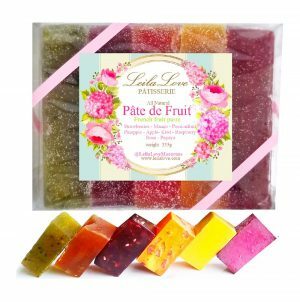 Pâtes de fruits or fruit jelly are very popular around the holidays and considered to be a luxurious sweets. In France, Pâtes de fruits are sold in high end pâtisseries or pastry shops. The French roll them in sanding sugar, which has large crystals that cling to the candy without melting.